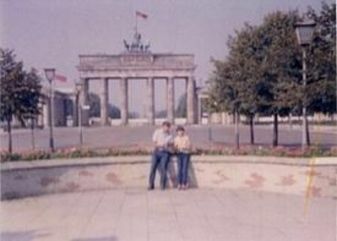 Berlin 1984 - We were on a family holiday touring Germany and had been down to Munich and Berchtesgaden. We were travelling up north and came to a major fork in the road. 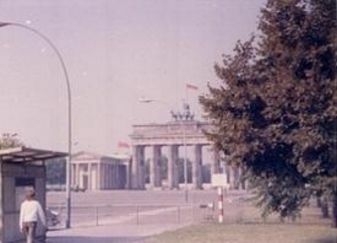 One road led to Berlin and it was decided that we would try to get into East Germany. Our first destination was Hof which was on the border. We camped overnight and joined the queue in the early morning to go through the custom post. The guards examined my car inside and out, under and over. I had a CB Radio in the car in those days and the guards took an interest in it much to the dismay of my wife. "We're going to end up in prison" she observed. However the gurad took out a pad and wrote me an official licence to use the "telefoon" in East Germany ! We drove slowly alongside a moving endless belt on which was all our belongings. A big blonde women came and checked our money and we were cleared to proceed. The whole operation had taken well over an hour. As we drove north the road surface deteriorated and the car was jumping from bump to bump. The foam padding we used as a base in the tent fell off the roof rack and disappeared into the trees. Then the roof rack came adrift and I had to tie my old jeans round the end so that it did not damage the roof of the car. We stopped at a roadside cafe where we had borscht and ghoulash ! We drove on to a small village where we stopped briefly. We were surrounded by people who saw our red car, assumed we were from the West and came to shake our hands ! We eventually arrived at the Campingplatz in Berlin Smockwitz quite late in the day and began to sign in. 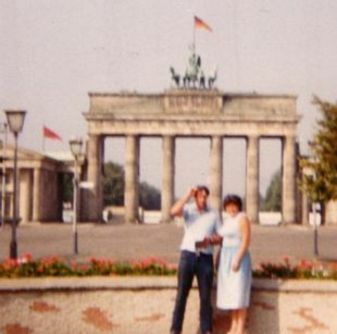 "Oh Nein" we were told, we had to sign in, in Berlin to register our presence in East Germany before we could camp. 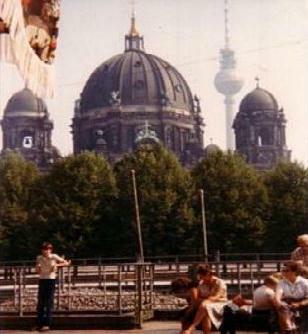 We set out up into Berlin seeing for the first time the golf ball on a stick, the Fernsehturm, which stands out and is the ideal way to guide oneself into the city. We arrived at the huge glass building, signed in and made our way back to the camp and were glad to get the tent erected and to be able to eat. We had Bulgarians on one side with bottles of wine and a West German on the other. He was there to meet his girl friend who was east German. The Bulgars sang and danced on until the early hours while our west German watched "Dallas" on his portable TV. I set up my CB Radio and because it was sideband contacted people on the south coast of England who sent me a QSL card (proof of transmissions) when we arrived home ! We spent a couple of days exploring in Berlin and watched the west Germans over the Wall which wound round the Brandenburger Gate. We also saw shops which were practically empty of items. 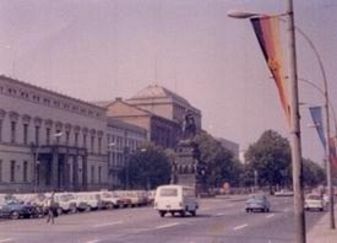 We parked near the Berliner Dom, had coffee, then walked into Alex square to have an ice cream which was just frozen milk and water. We had just finished when on the car radio came the news that a Korean jet had been shot down which might cause an international incident. We decided to leave Berlin and drove west, through the Magdeburg corridor where the road was bordered by wide open fields for security purposes. 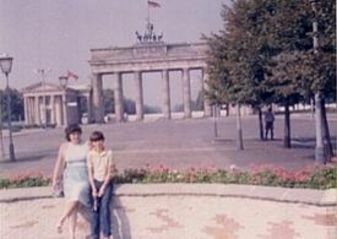 We went through a similar search to get out of east Germany..